Our modern society is "out of bounds"
In astrology a planet or heavenly body is "out of bounds" when it is more than 23�' north or south of the Earth's celestial equator. This is the maximum distance north or south(declination) the Sun reaches in its apparent yearly path around the Earth, and marks the solstices(June 21st and December 21st), and the tropics(Cancer at 23�'N and Capricorn at 23�'S). Most planets stay within this solar zone most of the time and are therefore "obedient" to their king -the Sun. Occasionally, however some planets "stray" beyond the confines and are deemed "unruly" or "out of bounds". Pluto and the Moon do this frequently. Saturn and Neptune never. Eris and the dwarf planets are most often out of bounds as are most comets and stars. A body that is out of bounds is deemed "sinful" or "rebellious" and is of the nature of Saturn or Uranus. What about peoples and nations? Are they subject to this "out of bounds" rule as well? Of course they are. If you look at the map. most of our modern or "civilized" world is in the out of bounds latitudes of the Earth, particularly in the northern hemisphere above 30� latitude. The Sumerians(and Nibiruans) extended the Sun's zone of influence to 30� on either side of the equator dividing the planet into three general zones, as I have done also. With some exceptions, cold is the primary feature of the out of bounds areas. 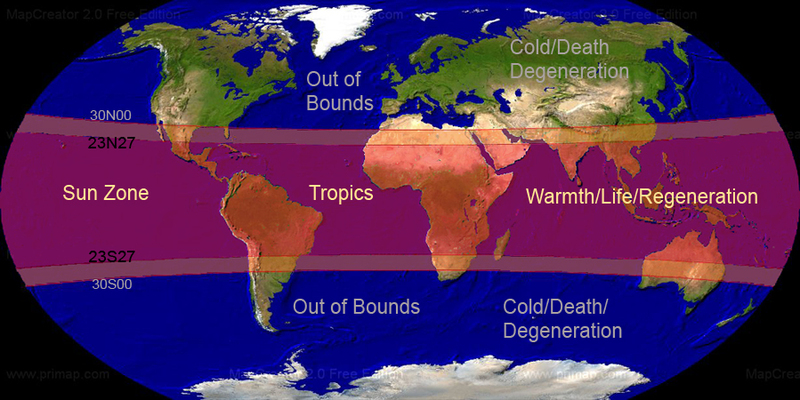 Cold equates to death or degeneration. It also equates to a lighter skin coloring and the emphasis of the head or intellect over the heart or intuition. The North is particularly male(more land) whereas the South is particularly female(more water). The white English peoples(Great Britain/Saturn and USA/Uranus) are currently the leaders of both the Northern and Southern out of bounds zones. They and their European and perhaps northern Oriental brethren are both the most technically advanced as well as the most morally compromised peoples on the planet. In contrast, the Sun zone peoples(with some exceptions of course) are in general less technical or scientific and more "spiritual" or in tune with God and nature. The Sun which represents God or the divine as well as warmth, light, life, and health or regeneration dominates the tropics from 30� north to 30� south. This is where most of humanity should be living and flourishing. Our attempts to adapt to the temperate and even polar zones through the use of fire and technology is slowly destroying us. We must artificially cover our bodies and heat our homes to survive there most of the year, resulting in poor health and pollution. We must also import most of our food from the Sun zone making us dangerously dependant. All of this and more has spawned social and economic slavery where the few profit over the many. The Sun zone eliminates most of this. Our bodies are healthiest when exposed to as much sun or air as possible. There is no need for heating, and if one is homeless he or she will not freeze to death. Crops or fruits can be grown year round by yourself and do not need to be processed, packaged, or transported long distances, eliminating garbage, pollution, pricing, and poor health. Solar or wind power are at their best here and would replace all harmful sources of fuel and energy such as coal and oil. The Sun also has the effect of making us happier, more loving, and creative by more powerfully stimulating certain glands and energy centers. Many physical and emotional illnesses are cured or greatly improved through warmth and light or Sun exposure. Of course, there is such a thing as TOO much sun which can be harmful, especially if you live in the desert or near the equator where it can be way too hot. There is obviously an imbalance or extreme of climates on our planet from the icy polar regions to the sweltering equatorial jungles and arid deserts. It was not always so. Something happened to our planet long ago to cause this imbalance. A home is not cold in one room and hot in another. Most homes or houses have equal or balanced temperatures throughout, and the same should apply to our Earth home as well. This was so before the great Flood of Noah, when domes or canopies covered our plane equalizing both the temperature and lighting, and can happen again when these canopies are repaired or restored. Then Earthly Paradise becomes possible, but it is basically up to the masters of this planet(or beyond) to decide how or when this will happen. We can do our part in small ways, but it will take superhuman power to really bring it about. In the meantime, moving to a warmer clime would not be such a bad idea.